According to the TOI, here is how Nazriya got adjusted to dogs. After marriage with Fahadh Faasil, her fondness for dogs is also one of the major changes in her life. In her upcoming movie Koode too, she is accompanied by a dog. The one big change, which occurred in Nazriya's life after marriage is that she has now became a dog lover. Nazriya was apparently very scared of dogs. The Mollywood heroine had to muster a great deal of courage to act alongside a dog in the movie 'Bangalore Days'. Do you want to know how she grew close to dogs? Fahadh Faasil is the reason. He along with his entire family of dog lovers. In the movie Bangalore Days, there were two dogs and Nazriya had to interact with both of them. While she was utterly petrified, profession demands it. After that Nazriya got married and stayed away from movies. Then one fine day Fahadh, according to TOI, asked if they could buy a dog. Nazriya was clear to convey her fear and apprehension. But after a while, Fahadh gifted Nazriya a cute little dog. And the surprise is Nazriya's heart melted. They named the dog 'Oreo.' Now she too loves dogs. She even said the puppy is like her kid. Oreo is their Shi-Tzu, it was named for its black and white colour. 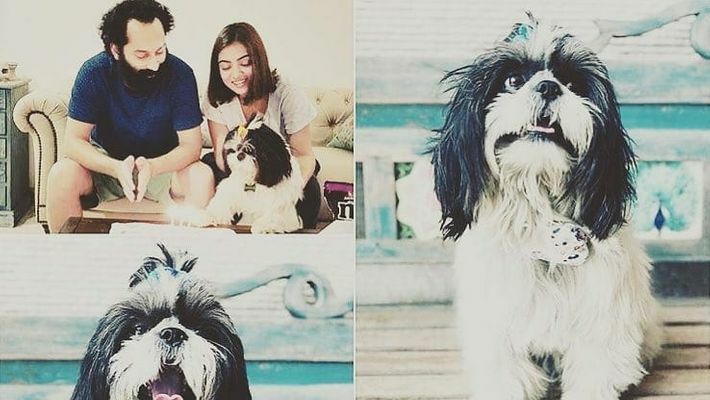 Nazriya has already shared many pictures with Oreo on social media.